Use our hotel list or map view to find the place that's just right for you! Discover the Benefits of Staying at a Disneyland Resort Hotel! Enjoy even more Disney magic on select attractions in one of the parks before it opens with Extra Magic Hour—available each morning to Guests of the 3 Hotels of the Disneyland Resort! Valid theme park admission required. Prepare yourself for fun in the sun with a magical array of splash-tacular pools, thrilling waterslides and kid-friendly spray-grounds—dive into the excitement that awaits you when staying at the Hotels of the Disneyland Resort! Why miss a minute of Disney magic? When you stay at the Hotels of the Disneyland Resort, you can relax knowing you're just steps away from Disneyland Park, Disney California Adventure Park and Downtown Disney District! Discover Craftsman-style elegance and a world-class spa. Rates based on this room type most nights February 24 to February 28, March 3 to March 7, March 10 to March 14, March 17 to March 21, March 24 to March 27, April 28 to May 2, May 5 to May 9, May 12 to May 16 and May 19 to May 23, 2019. Enjoy luxurious rooms and monorail-themed waterslides. This seaside-themed retreat features a scenic rooftop pool. 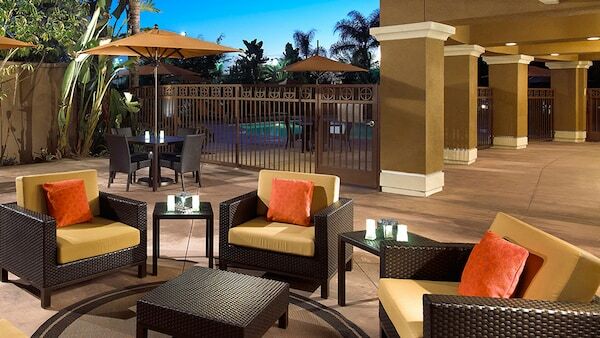 Find a Disney-approved hotel close to the Disneyland Resort.